One of the things that I’ve noticed in today’s gaming world is that the number of new gamers is an increasingly larger proportion than ever. As the overall popularity of boardgames increases, it is only natural for there to be more and more new gamers… Each time that we add someone new to the local game group, we do get a nice chance to pull out a bunch of “classic” games that are always as good as we remembered them to be when they first came out, but they simply don’t make it to the table that much as there are always new games to be played! A number of companies seem to be trying to take advantage of this by re-releasing versions of older games. Tasty Minstrel Games is co-producing the SuperMeeple version of this 2003 auction game. I still have my original RGG version from way back when, but this has been a hard game to get a hold of in recent times. 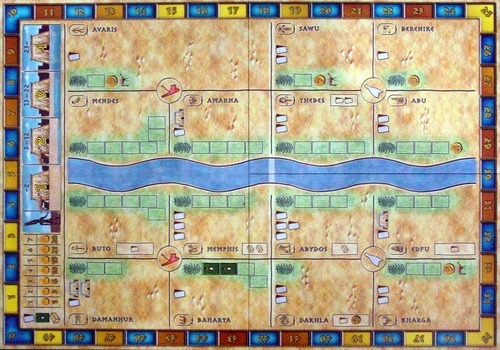 The game is set in the ancient land of Egypt in the time of the pharaohs, with players assuming the roles of rivals attempting to gain control of provinces, enhance their wealth and construct great pyramids. This struggle continues through both the old and new kingdom eras, with only the great pyramids surviving the passing of the epochs. The game has a rather straight-forward and rigid sequence of play, which is followed for six turns. 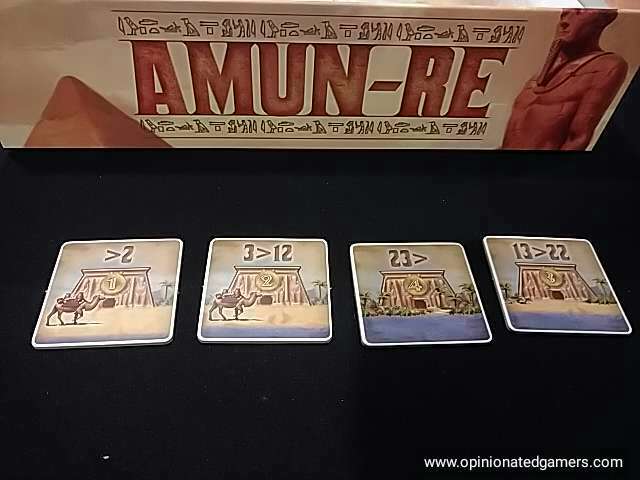 A scoring round is held after the third and sixth turns and the player with the most cumulative victory points has won the favor of Amun-Re and is victorious. Perhaps it is easiest to explain the game by following the sequence of play. Before I begin the explanation, however, it is very important to understand the layout of the board, its various features and the various symbols located within the provinces. 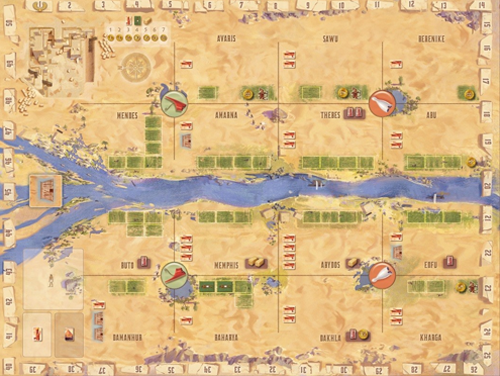 The board depicts fifteen provinces, divided amongst “lower” and “upper” Egypt… The board is further divided (in the other direction) by the Nile river. These subdivisions are important to understand as certain power cards will grant bonuses based on control of these provinces and their specific locations. Provinces also depict various symbols which are potential benefits conferred to the owner of that province. Some provinces grant the owner immediate benefits in the form of money, power cards and/or building stones. One province even comes partially populated with two farmers! Other provinces provide on-going benefits, usually in the form of income, temples or the ability to purchase additional power cards. Further, some many provinces provide space for farmers, which provide income, but the capacity of each province is limited. Players must carefully consider these potential benefits when engaging in the bidding struggle to gain control of the various provinces. The board also depicts various tables and charts. There is a price table that lists the costs of purchasing power cards, farmers and buildings stones. The temple track is used to indicate the level of tribute, in the form of sacrifices, paid to Amun-Re. This level will also determine the production output of the farmers as well as the value of temples during the scoring rounds. Finally, there is a score track that rings the board. Phase 1: Place the Province Cards. A number of province cards equal to the number of players are revealed and placed into the corresponding provinces. These are the provinces that will be available for purchase during the next phase. As mentioned, there are a total of fifteen provinces on the board. In a five player game, five will be revealed each round and all fifteen provinces will be owned by the end of three turns. When playing with fewer players, some provinces will not be auctioned. Phase 2: Acquire the Provinces. This aspect of the game is quite clever and reminiscent of the bidding mechanism employed by Phillipe Keyaerts in Evo. Each player will be able to acquire one card per turn, with each province going to the highest bidder. Each province card depicts a bidding scale, ranging from 0 – 36 (rising in multiples). The start player begins by placing his bidding stone onto one of the province cards at a level he is willing to bid. Each player, in turn, then does the same. If they place their stone onto a province card that already contains a bidding stone from an opponent, they must place their stone at a higher level. That player will then have his stone ‘bumped’ and must then re-bid by placing his stone on a DIFFERENT province card. He cannot immediately place it back onto the same province card (exception: a particular power card does allow this). This process is repeated until each province card contains only one bidding stone. At that point, each player places one of his province ownership markers into the province and takes any ‘free’ gifts the province bestows. Any farmers or building stones received must be immediately placed into that province, while province cards and money are kept by the player. The province cards are discarded, to be re-used in the second-half of the game when the ‘new’ kingdom emerges. d) How much to initially bid and the consequences of getting “bumped” from a desired province; etc. Phase 3: Actions of the Players. In turn order, each player purchases power cards, farmers and buildings stones, in that order. The cost of each category is calculated separately, with the amount being listed on the price chart located on the board. The cost escalates arithmetically: 1 = 1, 2 = 3, 3 = 6, 4 = 10, 5 = 15, etc. The number of power cards a player may purchase is limited to an amount equal to the number of power card icons displayed in the province he owns that depicts the greatest number of power card symbols. This is important as it limits the number of cards that may be purchased and adds yet another consideration to a player’s dilemma when deciding upon which provinces to acquire. Power cards are maintained by the player (no hand limit), while farmers and building stones must be placed into the provinces the player owns. When three building stones are present in a province, they are removed and a pyramid is immediately placed into that province. Some power cards allow pyramids to be constructed with only two stones. Phase 4: Sacrifice to Amun-Re. Each player secretly sets down a number of currency cards – OR his “-3” card – and they are simultaneously revealed. The value of all of the cards are tallied, with –3 being subtracted for each of these cards played. The temple marker is then moved to the appropriate space on the temple track. There are power cards which allow the player to adjust this total up or down three, but these cards must be played with the gold cards when making a sacrifice. The player who sacrificed the greatest amount to Amun-Re is rewarded with three items of his choice – power cards, farmers and/or building stones. The player who sacrificed the second-most receives two items, while everyone who sacrificed at least one gold receives one item. Any player who played a –3 card “steals” 3 gold from the treasury, but does not receive a free gift from Amun-Re due to his affront. All gold sacrificed is returned to the bank, while –3 cards are retrieved by the players playing them. There are important considerations when deciding on how much gold – if any – to sacrifice. Since the temple level determines the amount of income produced by farmers, players who possess numerous farmers may desire to see the temple level at a lofty level. Thus, they may wish to sacrifice large amounts of gold. Players with few farmers, however, may not desire a high temple level. However, by sacrificing too little money, you will likely not receive much from Amun-Re. And, of course, since all gold sacrificed is returned to the bank, one must consider the impact this will have on his financial coffers! Phase 5: The Harvest and Income. First, players earn income equal to the number of farmers they possess times the current temple level (1 – 4). Certain power cards increase this value by one per farmer in a particular province. Thus, the more farmers a player possesses, the more income he derives. Unfortunately, farmers do not translate directly into victory points during the scoring rounds, so players must balance their expenditures on farmers versus expenditures on other items which will yield victory points. Players also earn gold based on the provinces they own – maybe. Some provinces grant a certain amount of gold each turn, while others only grant this gold if the temple level is at level 1 or 2. So, players who possess these ‘conditional gold’ provinces have an interest in keeping the temple level suppressed. Finally, there are power cards that may be placed into a particular province and grant an income of 8 gold, regardless of the other factors present within that province. 1) Pyramids. Each pyramid is worth one point. 2) Complete Sets of Pyramids. For each set of one pyramid in each of the player’s three provinces, 3 victory points are earned. So, if a player has two pyramids in each of his three provinces, he would earn 6 victory points. 3) Province with the most pyramids on EACH side of the Nile. 5 victory points for the player owning each respective province. If there is an equal number of pyramids in more than one province, the tie is broken in favor of the province with the most building stones. If this is still tied, then both players receive the points. 4) Temples. Three provinces depict temples, one of which depicts two temples. A player receives a number of victory points equal to the current temple level for each temple he possesses. 5) Bonus Power Cards. Certain power cards grant 3 bonus victory points if the conditions on the card are met. These include having all of your provinces located along the Nile, or located on one side of the Nile, or located either in upper or lower Egypt. There are bonus cards for possessing at least 9 farmers or provinces depicting seven power card symbols. 6) Gold. This category only applies at the end of turn six. The player with the most gold receives 6 victory points; the player with the second-most gold receives 4 victory points; and the player with the third-most gold receives 2 victory points. This cycle is repeated for three full turns. After victory points have been tallied at the end of the third turn, all farmers and province ownership markers are removed from the board. Only the pyramids and building stones remain. Three more turns are played, after which the victory points are tallied one last time and the victor determined. This means that in turns 4 – 6, provinces will already contain pyramids and building stones, making them tremendously more valuable. This usually results in a substantial increase in the amount being bid for the provinces. A few additional notes are in order. Power cards seem to be essential. There are a decent variety of cards, with multiples of each type. Some, however, seem inherently more powerful than others. A good string of luck can give a player some significant advantages. For instance, in one game, I failed to draw one of the cards that give the player an extra farmer, while one of my opponents drew one every turn. He won. It is also possible to draw multiples of the same card, which is not beneficial since the rules prohibit playing more than one of each type of card in a turn. The rules do allow players to surrender undesirable card for 1 gold, but this small consolation does not overcome the setback for having poor draws. Even though one seems to have a variety of choices during Phase 3 (actions), as the game progresses, these choices actually seem to become more limited. Often, players have a limited number of cards they can purchase and a limited number – if any – of farmers they can accommodate. Thus, it becomes a simple matter of acquiring the few cards and farmers you can purchase and then spending the rest of the money you have allocated to building stones. This feeling of “too few choices” has grown more pronounced for me with each passing game. Further, in the past two games I’ve played, money has been plentiful, so after the first turn or two, there was no real “tight” money management aspect to the game. The new version uses the same rules as above. There is one other optional rule included in the game – it is meant for experts and only for 3 or 4 players. It allows for some tactical control of when Provinces are available. In Phase 1, players get to CHOOSE WHICH PROVINCES ARE AUCTIONED: At the start of the game after shuffling the Province deck, deal 3 Province cards to each player. Put the others in the box without looking at them. Players keep these cards secret from each other. At the beginning of each turn, each player chooses one Province card, then the chosen cards are all revealed simultaneously. These are the Provinces that are available at the auction this Round. At the beginning of the New Kingdom, the Provinces cards that were played during the Old Kingdom are shuffled and redistributed equally to players. 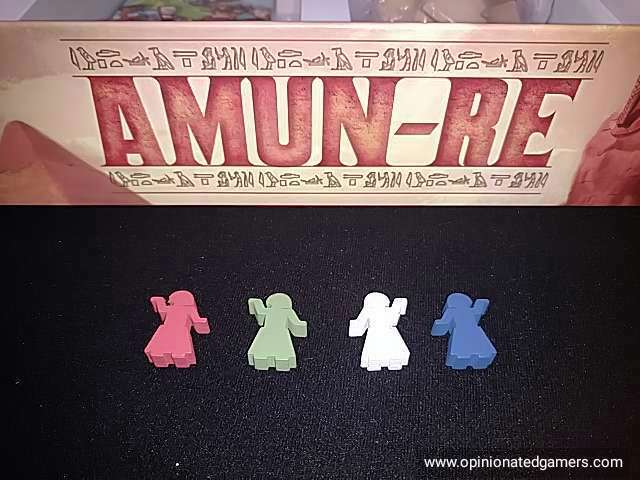 Amun-Re was one of the Knizia auction games that first caught my eye when I first started gaming (along with Medici, Ra, and Modern Art). Maybe it was a simple time back then, and they only had two or three main game mechanisms? Regardless, this had always been one of my favorite games, and I really don’t have any good explanation for why we stopped playing it other than my induction into the Cult of the New and starting to only play newer games at my weekly game sessions. This new version should be a great opportunity for new board gamers to experience a great auction game from 2003. The quality of the game has been known for awhile, and I’m glad that this new version gave me an excuse to get it back on the table. The jumping auction mechanisms feels very familiar now, but I remember it being pretty innovative at the time. The system encourages you to make an opening bid as high as you can tolerate because the larger breaks between bids can make the cost of provinces rise quickly. Of course, if you push up the starting price, you lose out on any chance of picking up a bargain – and this tension makes the bidding part of the game a nail-biting affair. There are many things to consider when trying to choose the best province for you – and some rounds, if there are multiple suitable provinces – you might just try to lay low and take the cheapest one possible to save your money for a more hotly contested province in a later round. The pyramids and stones are in a sand-stone like resin, and each player gets colored scribe meeples (think wooden forms of Steve Martin doing his Egyptian dance). This is a definite improvement over the colored chiclets from the original version. Do you need to have this version if you still own the first edition? No. There are some mild upgrade in the bits, but the game is the same. However, if you don’t own the game yet – now is your chance to get a graphically updated version of a game which is a proven classic. Patrick Brennan: I’ve only played, and still own, the original version. The game pulls together a lot of elements well – blind bidding, worker placement, auction, etc – so that the whole makes for an enjoyable game. I’ve frequently seen comments to the effect that it feels under-rated – I think these come from the fact that most people like most of these elements, but few people like all of them, so there’s always a bit that causes reservations. Still, it makes it somewhat attractive to a lot of people. The game seems best suited for 5 players as that increases the number of bidding wars, and for new players this means a better chance of players ending up paying close to correct valuation (which makes for a closer game). Playing with less than 5 gives a different game, and when played with experienced players, it could be argued that playing with 3 is best – it diminishes the luck-of-being-outbid auction element, and puts a much higher importance on getting the valuations correct every time. Brian L: I would regard this as a classic well deserving that title. One of the best from an era when clever twists on area majority and auction mechanisms was an active evolution, and a game I’ll still look forward to playing. Larry: This is one of my favorite 5-player games and, happily, it still makes frequent appearances in my group. It’s a multi-faceted design and the different elements mesh very nicely together. The auction works very well and is probably my favorite implementation of simultaneous bidding. Do you bid high for some prime real estate or try to get a bargain on a less desireable area? And just how high should you bid? The buying decisions of farmers, cards, and pyramids are always interesting and are dependent on the actions of your opponents. 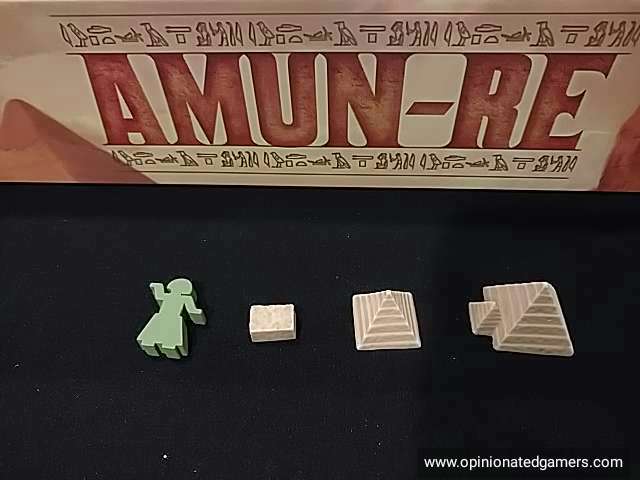 And while I’m usually not a fan of blind bidding, the sacrifice in Amun-Re is one of the exceptions that works for me, since you can see what your opponents want to accomplish. Occasionally, a player will get a string of bad luck with the power cards, but usually it’s just a matter of trying to get the most of the cards you draw and I enjoy this aspect of the game. This is one of Knizia’s last great designs and it’s a game I’ll always suggest when we find ourselves with 5 players. Dan Blum: I think the TMG version is larger than it needs to be, and I don’t think the bits improve on the original, but they’re fine and it’s nice to have the game back in print regardless of the box size. 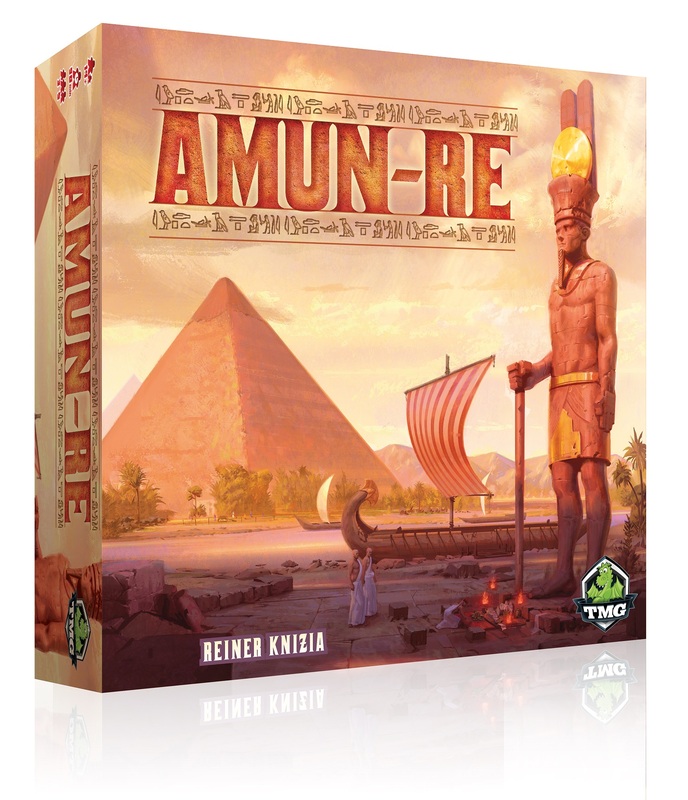 Jonathan Degann: To me, Amun-Re is Knizia’s last great gamer’s game. After this, Knizia focused on being a full time commercial designer of family games which generally ceased to interest me. It is an intense battle of ancient economic development which is always stressful and engaging. It presents players with unexpected challenges depending on how the plots of land come out, and what strategies players take in the first half of the game. Don’t miss this one. Note that the pre-production rules which were posted (on BGG, at least) were incorrect on at least one point, but the published English rules are correct. The French rules from SuperMeeple are probably still incorrect, though. Great game, I too still have my RGG copy. It is good to see it back in print. Having played both editions on back to back days, the Hans im Gluck edition was the clear winner. The compact board and clearer graphics made “seeing” the game much easier.